A German poster of the film "Flying Clipper", and a full-page advert "Frohe glückliche Fahrt" (a joyous, happy voyage) taken from the "Österreichische Film- und Kino-Zeitung" (Austrian Film and Cinema Newspaper) dated December 1962. The cinematic voyage started in Austria at Vienna´s "Apollo" cinema in January 1963 (German poster from the collection of Lars Heyn, Berlin). 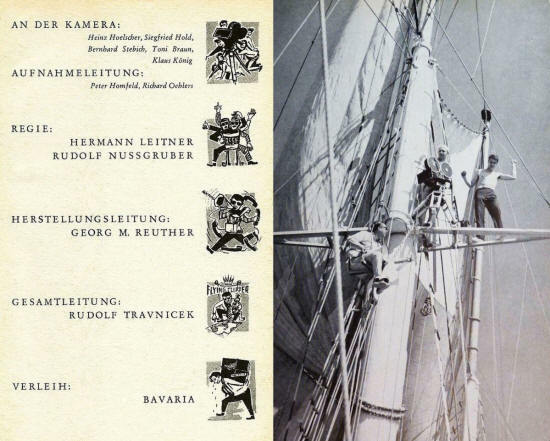 "Mediterranean Holiday" [the original German title of the film is "Flying Clipper – Traumreise unter weißen Segeln" (Flying Clipper – Dream Voyage under White Sails), West Germany, 1962] was the first German 70mm wide-screen colour production in the history of international film. 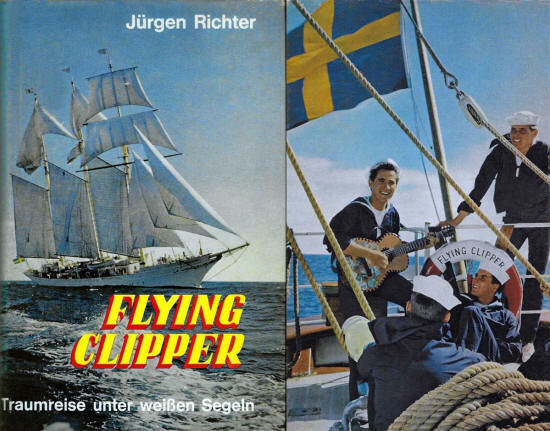 The film was the result of several months’ work following the voyage of the "Flying Clipper", a 600-tonne Swedish three-masted sailing ship, through the Mediterranean. This heralded the beginning of a new era for German film-making from an artistic, technical and commercial perspective. 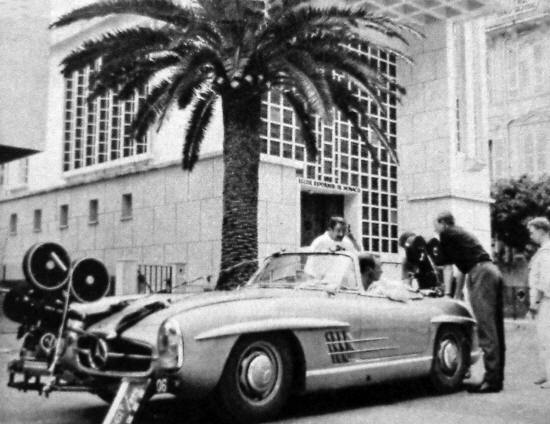 The 35mm format had remained unchallenged for around sixty years as the sole medium for recording and projecting film. Every film camera, every film processing and laboratory facility, every film projector and all sorts of other technical equipment were standardised to this film gauge. Although proposals were aired around twenty years ago to move away from the 35mm format, no decisive step in that direction was ever taken. Attempts were made instead to advance wide-screen technology based on the 35mm format – which actually gave rise to some very useful processes, some of which were used in the production of a number of very impressive films with strong audience appeal. Why was the 70mm film developed? Mounted on a sleek Mercedes 300 SL, MCS 70 cameras follow the hotly contested Grand Prix race. When, despite the success of wide-screen films produced in the 35mm format, technical experts – initially in America and now with renewed vigour in Germany – turned their attention to making 70mm wide-screen films viable, they had good reason for doing so. As experience has shown, audiences find cinema pictures more and more gripping the bigger and closer they appear; in other words, the bigger the dimensions and the closer the audience sits to the screen. However, enlarged 35mm images have the disadvantage that they can appear blurred and grainy under certain circumstances when the cinema-goer sits too close to the screen. Given that audiences have to sit a certain minimum distance away from the screen if acceptable picture quality is to be ensured, it is not generally possible to show them arbitrarily large images using 35mm technology. Ideal wide-screen projection in which audiences see just the picture without also seeing the picture frame, is virtually unachievable using 35mm film. Whereas 35mm film images have a usable area of approximately 320 square millimetres, the equivalent dimension for 70mm film images is nearly 1,100 square millimetres. This means that 70mm films can be projected onto screens that are three to four times larger with no loss of image quality – or that the audience can sit three to four times closer to the screen, given the same size of image. It is therefore possible to project a film onto a screen that almost completely fills the audience’s field of vision and that draws every member of the audience – regardless of where they are sitting – astonishingly and directly into the action. This does not necessarily require particularly enormous images; it is, rather, much more important to have the audience sitting quite close to the screen. The result is – and this is not sufficiently appreciated by the public in most cases, or is subject to inaccurate presentation – that 70mm films are at their most effective not only in really large cinemas (thousand-seaters, for example). On the contrary, for purely structural reasons, smaller film theatres are often much more suitable for screening this kind of film! The most important prerequisite is the ideal ratio of screen size to theatre length. Using 70mm technology, films can, where necessary, have a much greater impact on the audience in a small cinema with a 15-metre screen than in massive cinemas with screens twice that size. 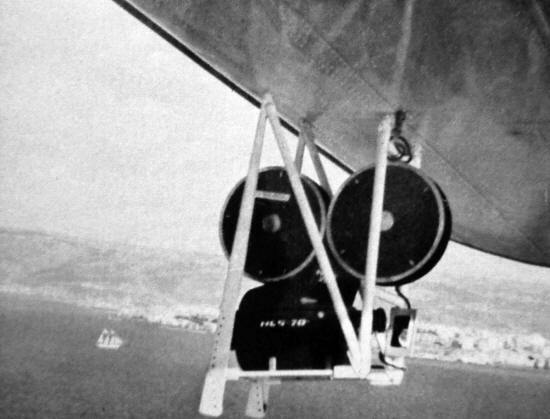 MCS 70 camera under the wing of a "Do 27", filming the "Flying Clipper" off the coast of Beirut. In view of the fact that the wide-screen film recording processes that had become established up to that point were of foreign origin, it is even more to the credit of Rudolf Travnicek and Rudolf Englberth, the owners of "M.C.S. Film KG" (Munich), that they took on the risk of initiating the construction of a German 70mm camera despite overwhelming international competition. The MCS 70 camera, first used in the filming of "Mediterranean Holiday", was developed by Jan W. Jacobson, a Norwegian engineer living in Copenhagen. Developed as a reflex camera, the device is extremely simple to construct and operate. One particular advantage of the MCS 70 is that the height and width of images recorded on 65mm negative film can be "squeezed" into dimensions using an optical reduction system that was also developed by Jan W. Jacobson, that correspond to other common wide-screen formats (such as CinemaScope, for example). 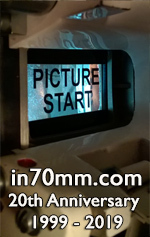 In addition to the 70mm format, prints can also be made in 35mm CinemaScope format, 35mm wide-screen format and 16mm CinemaScope format, if desired, while retaining the unique image quality of the original. 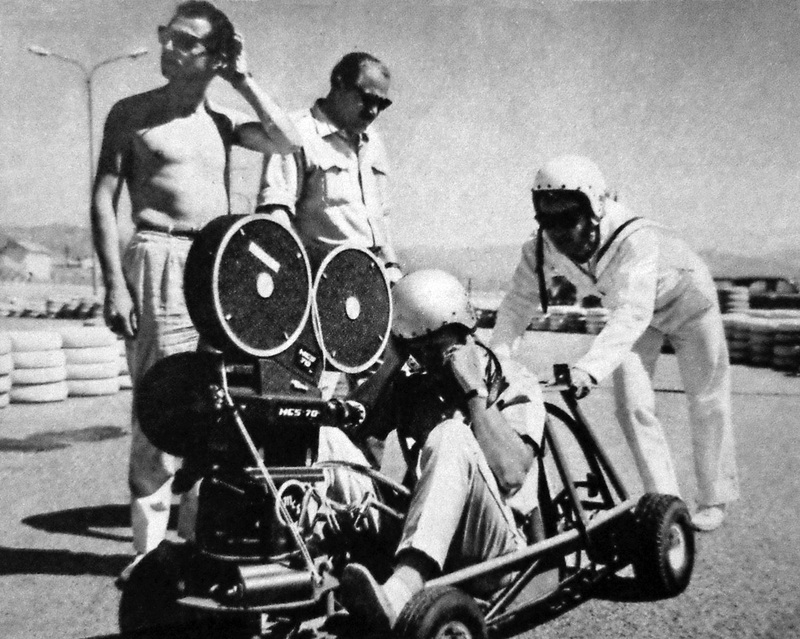 A go-kart in Antibes is converted into a MCS 70 camera dolly in order to capture images for exciting fast-paced film scenes. The system also accommodates all sound recording processes. 70mm prints are normally equipped with six-channel stereo sound, which significantly enhances the audience’s experience of the large colour images before them. CinemaScope prints can be supplied with either four-channel stereo sound or with optical sound. "MCS" stands for "Modern Cinema Systems" – an apt term for such a modern, versatile and future-orientated process. It is therefore entirely appropriate to describe the screening of Bavaria-Filmverleih’s MCS 70 colour film "Mediterranean Holiday" as the most significant event in German cinematography for many years! FLYING CLIPPER – Le VOYAGE INOUBLIABLE (Flying Clipper – the unforgettable voyage) - the original French poster (from the author's collection – size:1.60 x 1.15 metre). Top right: the film at the "Empire (Abel Gance) Cinérama Théâtre" in Paris – now successful for 8 weeks. The photo was taken on Sunday, 6 December 1964 at 2 pm. 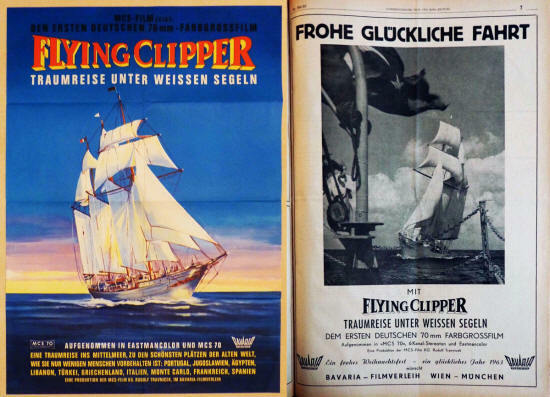 Like on the first day, "Flying Clipper" a triumphant success applauded by an enthusiastic audience at each performance. The film´s screening continued at the "Empire (Abel Gance) Cinérama Théâtre", and subsequently it should move to the Parisian "Cinérama Gaumont Palace". 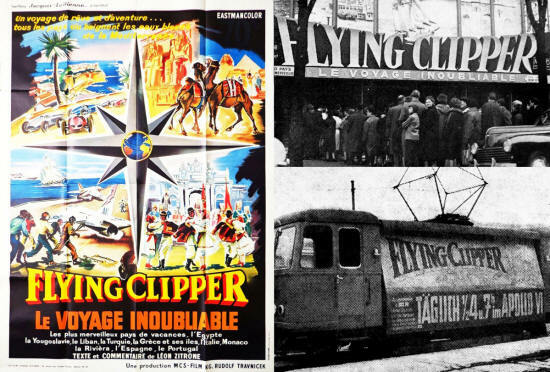 Distributor: Les Films Jacques Leitienne – 52, Avenue des Champs-Élysées (image and information taken from "La Cinématographie Française" dated Saturday, 12 December 1964), and below an advertising in Vienna (Austria): Bavaria-Film promoted "Flying Clipper" with the help of an electric railcar. Daily screenings at 3.30 and 7 pm at the capital´s biggest movie theatre "Apollo" (image from "Film-Echo" dated February 1963). "Neues Filmprogramm" (No. 3063, Vienna, 1963, 4 pages), and images on the right: the film in Switzerland. Advertising from the trade magazine "Schweizer-Film-Suisse" dated 20 December 1962, and 20 August 1963. Despite summer and heat since 11th May 1963 an extraordinary success. "Flying Clipper – Traumreise unter weißen Segeln" photographed in Eastman Color and MCS 70. From 20th August large-scale use: in 70mm format / in CinemaScope and magnetic sound / in CinemaScope and optical sound (distributor: Stamm Film AG.). Book published by Copress-Verlag Hoffmann & Hess, Munich, 1962 / 221 pages – including 32 pages with many described pictures in black and white (from the author´s collection). 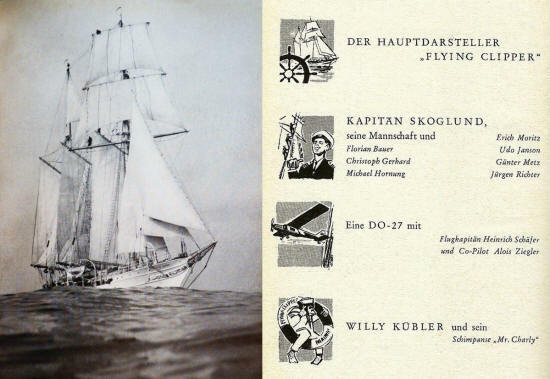 The author Jürgen Richter, although not the oldest, but with 1.92 meters in length the largest of the seven German boys (see list of names under "Captain Skoglund" in the following image) on board, tells his and his comrades` experiences during the unique film voyage in a mostly cheerful, but sometimes also serious way. The book´s chapters: Egypt / Our Ship / Lebanon / Turkey / Rhodes Island / Turkey again / Greece / Greek Islands / Yugoslavia / Italy / France / Monaco. 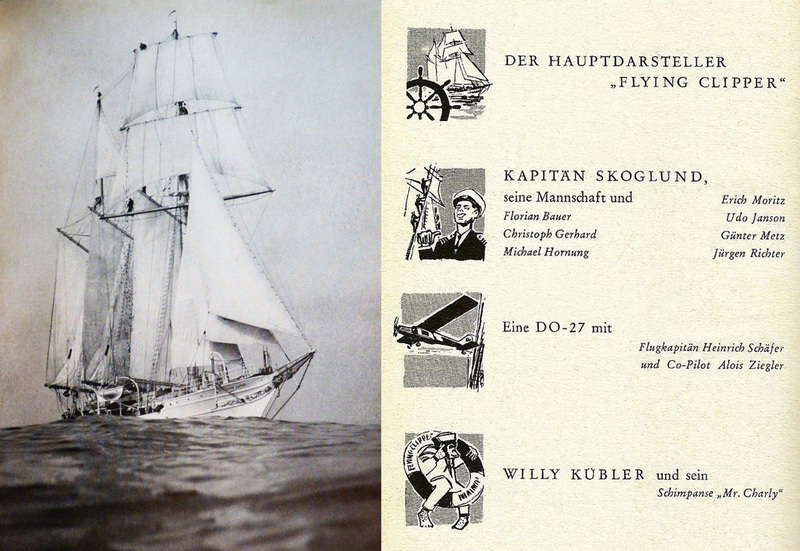 The main actor: "Flying Clipper" / Captain Skoglund, his crew, and the German boys: Florian Bauer, Christoph Gerhard, Michael Hornung, Erich Moritz, Udo Janson, Günter Metz, Jürgen Richter / A "Do-27" with flight captain Heinrich Schäfer and co-pilot Alois Ziegler / Willy Kübler and his chimpanzee "Mr Charly". 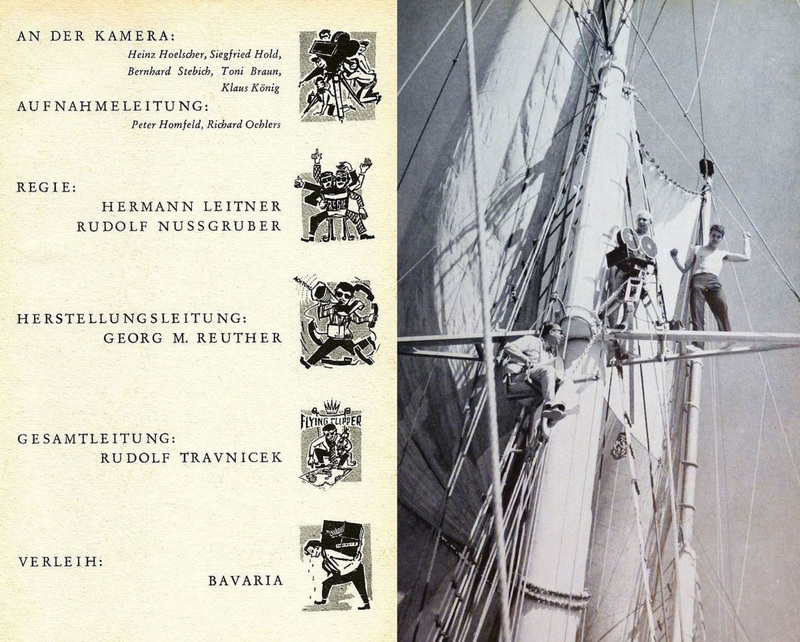 Director Rudolf Nussgruber in lofty heights in a pulley chair – 25 metres above the deck. Above him cameraman Siegfried Hold with Michael Hornung as assistant.